Animal Trust Blackburn is a successful surgery and the go-to veterinary surgery for pet owners in Lancashire. The surgery has 3 operating theatres, x-ray and ultrasound suites, dog and cat inpatient wards, together with consulting and outpatient facilities. 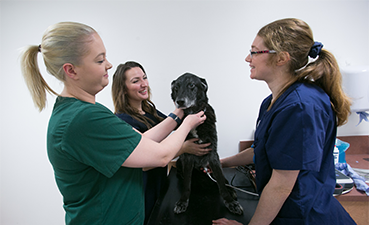 The Blackburn surgery also has an in-house laboratory to provide a quick diagnosis and best course of treatment for your pet. The Blackburn surgery works closely with the Animal Trust’s 24/7 centre in Bolton. Patients using Animal Trust Blackburn are therefore able to access services including CT scanning and 24/7 care. As with all of our Animal Trust surgeries, there is no consultation fee to see the vet. This is backed with Animal Trust’s inclusive and upfront pricing policy on treatments, reducing the cost and anxiety that exists with some veterinary surgeries. The team at Blackburn regularly receive praise through reviews and feedback. The team of vets and nurses are not only professionals, but also personable, friendly and committed to delivering the care that a pet needs. This includes using the right tests and treatments so that no more is done than what is in the pet’s best interests. Our Blackburn surgery is open to everyone, and we are able to arrange the transfer of your pet’s existing medical records to our surgery which is a straightforward and simple process.